I've gotten lots of requests over the years for a Swagbucks review, so here it is. If you're not already members, I think most of you have probably at least heard of the site. It's a rewards site that makes it possible for you to earn cash and incentives in lots of different and fun ways. It should be noted from the start that Swagbucks is not a job. No one does it for a living. But, it's a pretty lucrative side earner that's worthy of mention here. I have personally used and benefited from the site over and over again since I became a member quite a few years ago, and in my opinion, it is worth spending some time there. As mentioned above, they have a ton of ways you can rack up points on this site, also known as “SB”, which is their virtual currency you can trade in for Amazon gift codes, Paypal cash, other types of gift cards, and actual merchandise. Many of the things you do to earn SB are things you're probably doing every day online anyway — so there's no real reason NOT to do them through Swagbucks and benefit yourself. So as you can see, this is a site where you could easily kill a lot of time. I could think of worse places to kill time online where you're NOT getting rewarded for doing so. Who Is Eligible to Use Swagbucks? Swagbucks is open to people in the US, UK, CA, AU, IE, and possibly other countries, aged 13 or older. What Can You Get With Your Swagbucks? As mentioned above, you can get all kinds of things, but the two most popular redemption options are the $5 Amazon gift codes (costing 500 SB) and Paypal cash (lowest amount for redemption there is $25 for 2500 SB). How Many SB Can You Realistically Earn Per Week? This all depends on how often you use the site. Obviously the more you participate, the more you will earn. Each SB is worth about one penny. Earning $30 to $40 per month in SB is definitely do-able, but some people are able to earn more. I'll be sharing some strategies with you for maximizing your time spent there below. You can become a “power user” rather than a casual user and really make it pay off. Just think — if you started using the site every single day starting now, you could begin stockpiling those Amazon gift codes and use them for your Christmas shopping! Knowing you had all that Amazon money put back would certainly take a lot of the financial stress off of the holidays. #1 – Log in every day and do as MUCH as you can. For me, it used to be a first-thing-in-the morning habit that I would spend time on while enjoying my coffee. Take the daily poll, follow the offer path, answer any available surveys, watch any available videos. None of these little things take that much time. #2 – Make sure you're using Swagbucks as your primary search engine. Think twice before going to Google to search. Every search you do is a chance to win more SB, although they will know if you're not searching naturally, so make sure you only use it when you really would be searching otherwise. 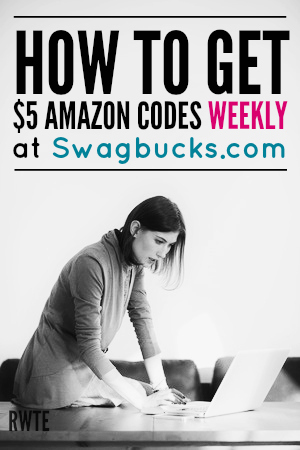 #3 – Go through Swagbucks to do ALL of your online shopping. This is set up in a way similar to Ebates where you can earn a certain amount of bucks back for every dollar you spend. If you already use Ebates and like it better, that makes sense. But if your goal is to earn as many SB as possible, your online purchases can really help them add up. For example, did you know that many of the things you buy through Amazon can get you bucks? #4 – I know a lot of you religiously print off coupons. You can do this through Swagbucks every time and get 25 SB for printing off 10 coupons in a session. #5 – This might be the most valuable tip — download and USE the Swagbucks app on your smartphone, tablet, etc. Did you know that there is a Swagbucks TV app that will allow you to run videos in a continual loop? And these are videos that you get bucks for watching. So, similar to Perk TV, you can just leave it running on your device and earn without really doing anything else. There is a cap in place of about 36 SB per day through the TV app. BUT, there are other apps where you can watch videos and earn SB, too, including sport.ly, lifestylz.tv, and EntertainiNow. I have not personally tried these apps, but I've read that some people are able to earn $5 to $10 in Amazon gift codes per week just using the video apps! #6 – Download and install the Swagbucks toolbar. Having the toolbar sitting there in your browser will make it much easier for you to remember to do your searches through it and overall just use the site. Plus, when there are SwagCodes available to find, you will get notifications about it through your toolbar — thus ensuring you don't miss out on the extra points from those. If you don't like installing toolbars, they also have extensions for IE, Chrome, and Firefox browsers, but from what I'm reading the toolbar may have more features. #7 – Keep tabs on the offer wall. Some of the offers are free to do and can mean some quick bucks, while others will require making a purchase. Obviously you'll want to be pretty selective which ones of these you do. How Long Does It Take To Get Your Rewards? It can take up to ten business days for your reward to be delivered to your email address once you've redeemed, and from 10-14 days for you to get Paypal cash if you've requested a Paypal payment. In my experience, this is pretty accurate. You will definitely get paid, but it won't happen instantly. What Do People Say About Swagbucks? This is an old, reputable reward site. They have millions of daily users and there is a reason for that — because it's not scammy and they pay as promised. Plus, they've managed to make the site very fun and interactive for their users. It keeps people coming back. I've read many, many success stories from people who used the site all year and earned enough Amazon gift codes to buy Christmas for their families. It can absolutely be done! While I have not used Swagbucks as religiously as those people, I have used it enough to see that that would be possible if the effort were put in. I think the most I've personally earned in one month is around $20 in Amazon codes. Go here to register for Swagbucks if you aren't already a member. And please do comment below if you've used the site with success and share your story with others, plus any tips you might have for making the most of it. I love using Swagbucks. I believe I’ve been using them for about four years and have made at least $400 with it. I take the Daily Polls, occasional surveys, and shopping mostly. I agree that it is well worth it. Also, I feel that if I want something expensive, I don’t have to ask my husband if it would be okay to buy because I’m not using our money.